IMF Blog | Stay up to date on the latest Infinite Music activities and get a look behind the scenes. Turn your passion for music into action for music education! Hearing Unique Musical Perspectives From the Road! Professional musicians and bands touring the country today all have interesting stories to tell about how they got into the music business and how music became part of their lives. Where did they get their start? When did they hear “the calling” that led them to become professional musicians? What’s it like being on stage in front of thousands of people? Why do they believe music needs to be a part of every young person’s education and life? Recently, Infinite Music’s founder Sarah Mason had the unique opportunity to speak with two very different bands from different origins—the wildly eclectic latin, hip-hop sounds of Los Angeles based Ozomatli, and country blues greats from rural Brown County, Indiana, The Reverend Peyton’s Big Damn Band. Here’s an opportunity for 3rd, 4th, and 5th graders to take group ukulele or percussion/drumming lessons at Del Mar Elementary in Morro Bay, starting October 2nd! • No prior musical experience needed. • Classes are after school, on-site. 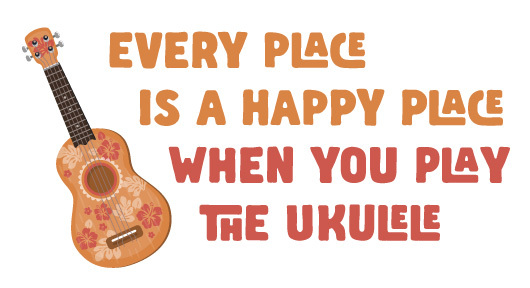 • Ukuleles provided to participating students only and can be checked out to take home for practice. INFINITE MUSIC ON THE ROAD! Infinite Music headed to the mountains this past August to be part of the 23rd Annual Mammoth Festival of Beers & Bluesapalooza in Mammoth Lakes, CA. This long-standing four-day festival was attended by over 6000 people and featured Grammy Award-winning performers and some of the best craft brewers in the country. Along with that illustrious lineup of performers the Mammoth Husky Club Ukulele Kids opened this year’s festival on the big stage with a song they wrote with their instructor Leina’ala Kailiawa. The Husky Club Uke Kids are part of the ongoing MAKIN’ MUSIC AFTER SCHOOL program that Infinite Music has been funding for the past year in the local school district. Gettin’ Happy in 2017 with the Ukulele! Looking back on 2017, I am so thrilled that Infinite Music was able to bring free ukulele group music lessons to over fifty elementary children through our grassroots Makin’ Music After School program. None of the kids in this program had access to music lessons previously, and probably never would without this special opportunity.